You'll be £25.00 closer to your next £10.00 credit when you purchase Wanton Troopers. What's this? The causes of the three ‘English’ Civil Wars (1642 to 1645, 1648, and 1651) are complex and controversial – clashes of conviction, belief, and personality, and a struggle between opposing social groups and economic interests. But, whatever the focus of scholarship, many answers can be sought at the local level, among county communities that were far more outward-looking than once suggested. That is why Ian Beckett’s in-depth study of Buckinghamshire, one of the pivotal counties during this turbulent period in British history, is of such value. None of the best-known battles or sieges took place in Buckinghamshire, but there was destructive combat in the county on a smaller scale because its location placed it on the front line between the opposing forces – between the royalist headquarters at Oxford and the parliamentarian stronghold of London. As Ian Beckett shows, the impact of war on Bucks was considerable. His analysis gives us an insight into the experience of local communities and the county as a whole – and it reveals much about the experience of the conflict across the country. 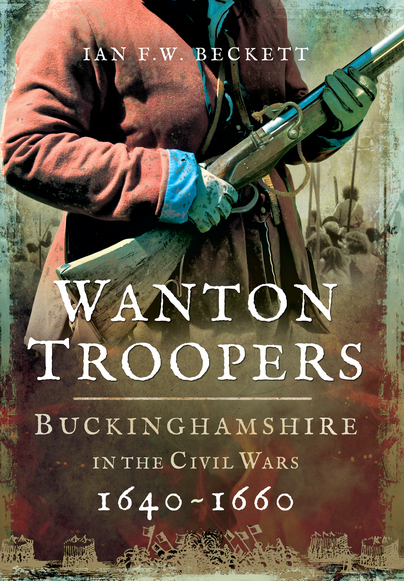 As an in-depth study of the social and political events and the general military activity in Buckinghamshire this book is an invaluable resource on a county during the civil wars and has much to recommend it. This is a useful examination of the impact of the Civil War on the county community, showing that even areas that didn’t suffer a major battle or siege were affected heavily by the conflict. It will also be of great interest to local historians in Buckinghamshire. Beckett's book is, as he says early on, based upon his notes for the Civil War Exhibition at Bucks County Museum in 2004-5 and this accounts, in part, for the somewhat eclectic coverage of some aspects of the period in this book. There were no major military actions within the County during the 1640s and 1650s but this book is very much about 'A County at War', which could well have been its subtitle. As you might guess from the above opening lines I found some aspects of the book frustratingly light on detail - in that I wanted more - but I accept that there is only so much that you can get into a book like this without turning it into a detailed, but almost unreadable, study. To be fair the same criticism could be laid at so many other County Histories and within its 200 pages Becket does give an excellent account of both the war within, and the effect of the war upon, Buckinghamshire - this is a book about the County during the War and successfully misses falling into the trap of simply discussing the English Civil Wars as a narrative simply alluding to the County by their effect on it. All in all this is a well-researched and eminently readable (and certainly top marks for this latter point) account of Buckinghamshire during the mid decades of the 17th Century and deserves a place on the bookshelf of anyone interested in either the English Civil War or simply the history of their County.